Funded by the COST Action TD1210 KNOWeSCAPE, our short term mission to The Netherlands, from 9 – 17 July, aimed to study metrics and evidence suitable for institutions which operate in areas of high interdisciplinarity. The STSM was hosted by an institute of the Royal Netherlands Academy of Arts and Sciences, Data Archiving and Networking Services (DANS). The main objectives of this study were to order and organize the data of six annual reports published by such scientific organizations, located in The Netherlands, Switzerland and Germany. We have studied scientific, activity, annual reports of six organizations who take action in the same interdisciplinary environment. Some of them were located at the Royal Netherlands Academy of Arts and Science (KNAW), which has created institutes, including Data and Archiving Network Services (DANS) or initiatives, like Virtual and Knowledge Studio (VKS) and eHumanities that promote new research practices and infrastructures in the humanities and social sciences. Other organizations, reports of which we have studied, have been The Netherlands eScience Center which is collaborating with the international Lorentz Center for scientific workshops. The first step of this work was tο study and analyze the documents. The methodology comprised desktop and web research, brainstorming sessions with the team members at DANS and the supervisors of the study both in The Netherlands and Greece, observation and development of a research design, using also the classification scheme UDC (Universal Decimal Classification). During the week we wrote up a preliminary report about our findings, also as an exercise of academic writing. We did extensive web research through organizations’ websites in order to find the appropriate information, including their missions, sectors activity and the possible correlations between them. We also did web research to study the UDC scheme as a basis to classify the reports. We used the main categories of the main tables, and also included a classification of place and time according to the common auxiliary tables. More specifically, on Tuesday we got an introduction into the project of a DARIAH Competence Center (CC) portal interface by Rene van Horik, and participated in the discussion with Mike Priddy about different digital library tools developed by ICT centers for use in Digital Humanities. 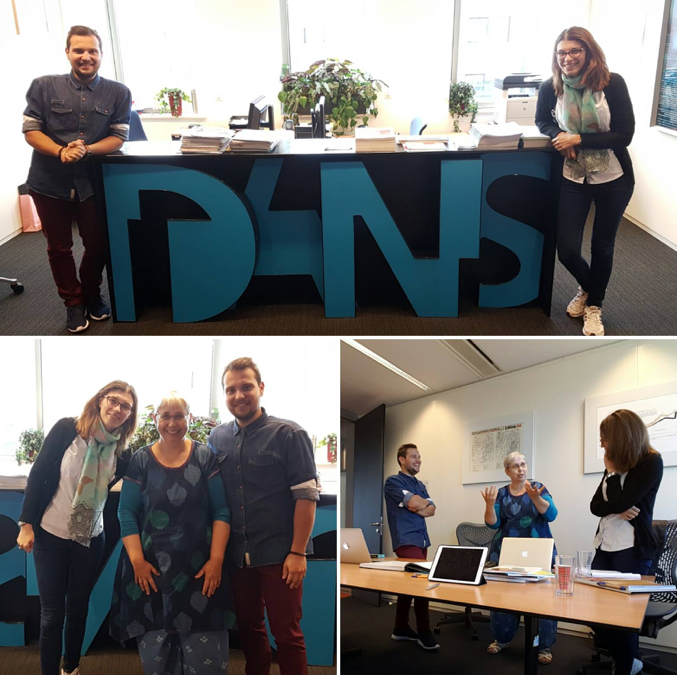 From this meeting we got as an additional assignment to look at the pilot interface of DARIAH Browser in “Science Gateway for the Long Tail of Science”. We wrote up our observations and gave feedback to Rene van Horik on Friday. 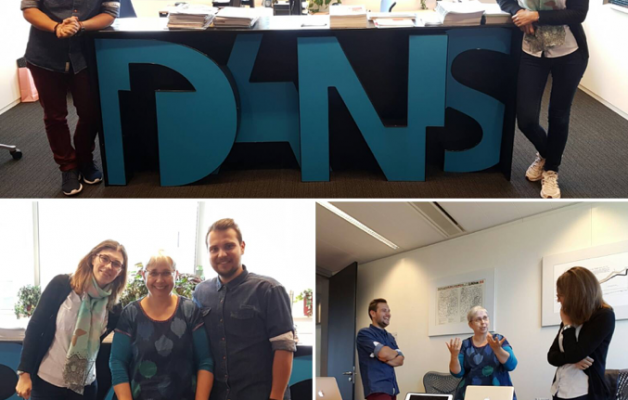 On Thursday, we attended a webinar on “How to write a Data Management Plan” by Sarah Jones (DCC) and Marjan Grootveld (DANS) both involved in EUDAT and OpenAIRE. Attending of this very useful webinar was part of our training (as part of the STSM) at DANS and it helped us: a) to understand deeply the new environment of Open Access, b) to broaden our knowledge on how the organizations and institutes handle scientific research data, c) to boost our thoughts about the ordering and classification of six reports. On Friday, we had a brief meeting with Rene van Horik to give him a feedback on the project in that he participates. We made some proposals regarding the browser interface of “Science Gateway for the Long Tail of Science” with purpose to be more user-friendly. In the late midday, we had our final meeting with our supervisor at DANS, Dr. Scharnhorst to summarize our thoughts and ideas and presented our design classification of six reports. We discussed a lot on this draft plan and the possibility to proceed. In addition, we discussed on correlations among institutions and their role in new multi-disciplinary environment with reference to “Mode 2” concept. After that, Dr. Scharnhorst showed us the very significant book titled “Atlas of Science”, by Katy Borner. Acknowledgements: We would like to express our gratitude to the COST action which funded us, DANS (Dr.Andrea Scharnhorst) and our Prof. Panayiota Polydoratou from ATEI of Thessaloniki for her trusting and supporting us in our endeavour. Souzana and Dimitrios’ visit to DANS had been originally envisioned for GP 3 (end of it), but due to budget restriction got realised only in GP4. We had originally planned two separate assignments but while preparing them in detail, decided to go for one assignment, and let the students work on them as a group. The assignment was to look into Annual reporting of academic organisations, in particular of ‘odd’ one, institutions or organisations with a temporal assignment, and /or a specific network function, in short, organisations which are called ‘Mode2’ institutions in science and technology studies. – To let them apply their competencies in information science to come up with dimensions (category) along which those reports and the institutions authoring them can be ordered. The students worked very intensive, and were very creative when it came to the assignment. They were able to apply their profound training in library and information sciences to an area new to them. It was a pleasure to watch and guide this. They also actively participated in the research group meeting, contributing substantially to the discussion. We discussed eventually how to continue this project. Both students will write a thesis (Ms) coming autumn, and they will discuss with their supervisor in Greece if the topic of the STSM is suitable to be continued and extended, and to be made part of their thesis. Depending on this outcome, they might present a poster in Sofia. We also discussed other grant schemes (PhD positions in the future and Erasmus programme). It was a privilege to host both students at DANS. How to do a STSM?